Look here Jetty...I know I won. I copied exactly what was on the front of that book. It's called a Royal Flush. Don't be a sore loser. Besides that...you can't even turn your cards over. Just because you can play Jenga doesn't mean you can play Poker. 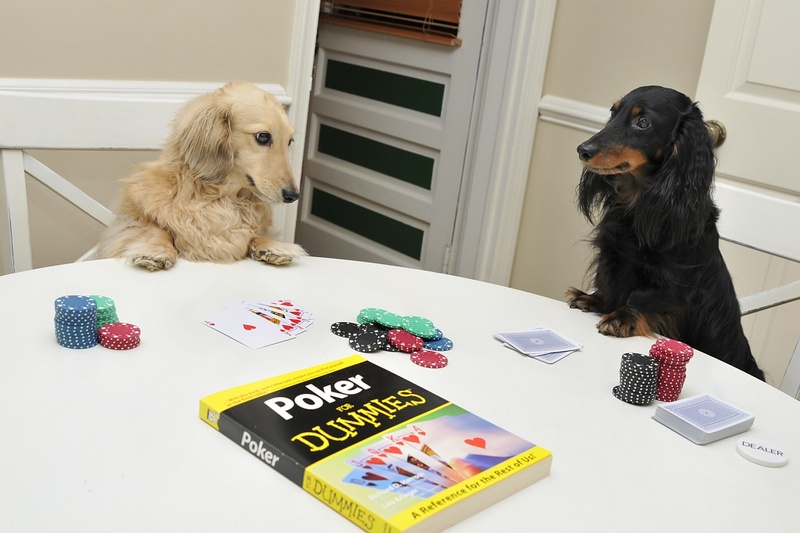 It was only a matter of time before a dogs playing poker photo was shot. ;) So cute! I'm waiting for the pool table to feature. Listen you two...I need players for my IPhone App-Words with Friends....let me know if you're interested! You are so funny. I just adore your wit. I could sit for a thousand years and never think of the wonderful stories you put with your wonderful pictures. What a gift you have! This is so adorable, and I really want a book. What fun! I'm glad they're not drinking and smoking... gambling is vice enough for these little guys! Your pups are definitely great collaborators. You might even call them your partners in crime! Great shot and story! love love love this and their expressions are PERFECT!!! OH Kay...I so missed the doggies, the last few days! I also always wonder when you are going to run out of ideas, but you never do. They're always so clever, and always give me a lift and makes me smile! How about Sheridan Avenue boys in Las Vegas! !